with Challenger SRT8 392 (right). Those of us who were around in the 1970s or who like to hang out in the muscle car section of classic car shows remember the bright colours Dodge put on some of its cars. We’re talking hot pink, lime green, bright orange. If you drove one of those babies, you got noticed. 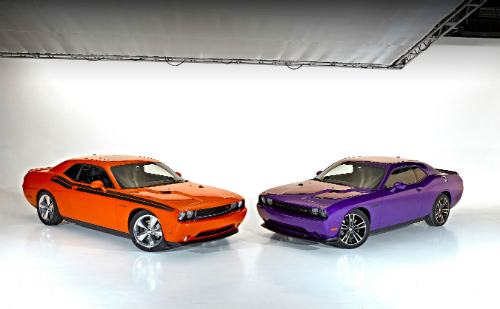 Well, for a limited time, it will be possible to buy the Dodge Challenger R/T Classic and the Dodge Challenger SRT8 in Plum Crazy. They’ll be doing a limited production run starting next month, and are already taking orders for delivery this spring. Prefer HEMI® Orange? No problem. They’ll be producing the Dodge Challenger R/T, R/T Plus, R/T Classic and SRT8 in that colour in May, again in limited numbers. Makes me nostalgic for my old Charger. While today’s Dodges may look like their classic ancestors, they’re modern where it counts. Those who buy the 2013 Dodge Challenger SRT8 392 in one of the heritage paint colours also get a day of professional driving instruction. Sweet. Even better news for us Canadians is that the cars will be built in Brampton, Ontario. 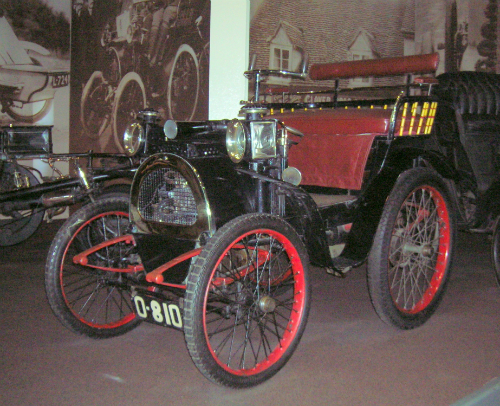 Here’s the last of the pre-1915 vehicles I saw at the National Motor Museum in Beaulieu. 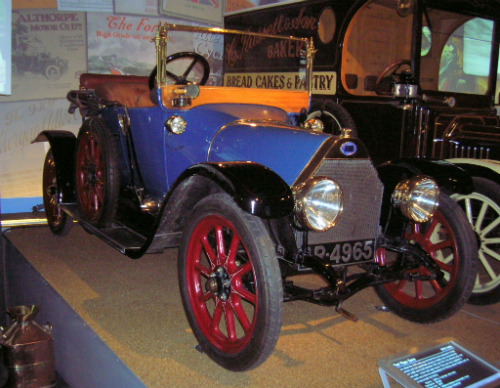 For more information on any of their vehicles, check out the vehicle list on the National Motor Museum Trustwebsite. 1903 Napier: The “Gordon Bennett” Napier, according to the plaque in the museum, is the “oldest surviving complete British racing car.” It was driven in the 1903 and 1904 Gordon Bennett Cup as part of the British team, but failed to finish, crashing both times. It’s the oldest car to sport British racing green—the colour chosen because that’s the colour Napiers were painted. 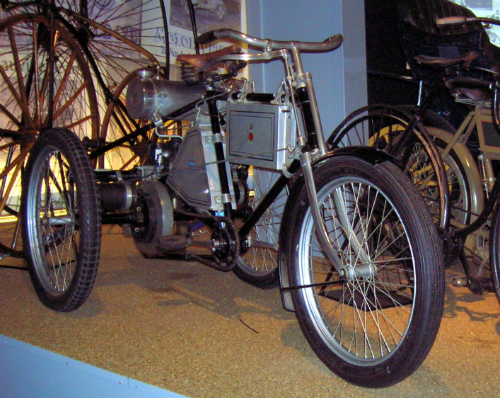 1905 Matchless motorcycle: An early British-manufactured motorcycle produced by H.A. Collier and Sons, a company known for its bicycles. The vehicle list notes that the sons in question were interested in racing, so it’s perhaps not surprising this motorbike could do 30 mph. 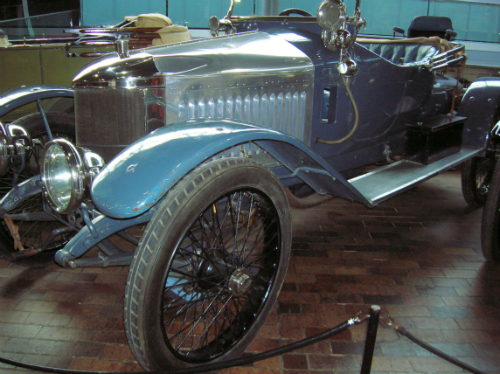 1910 Bugatti Type 15: I love Bugattis. This particular one is said to be the oldest in Britain, and the second oldest surviving anywhere. It started life as a saloon, but was changed to a two-seater some time after 1920. It belonged to Madame Bugatti and may have seen service in World War I, before being imported to Britain. It’s been used in races and hill climbs. 1913 Fiat Tipo Zero: The first mass-produced Fiat, body by Farina, with more than 2,000 produced between 1912 and 1915. Kids were popped into the rumble seat. According to the vehicle list, a garage used this one as a tow vehicle well into the 1940s. 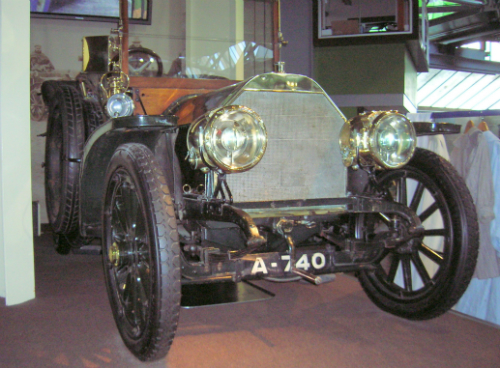 1914 Vauxhall Prince Henry: The plaque calls this one of the first true sports cars, and says it would do 75 mph, quite fast for the time. This particular model has only had one owner and has very few miles on it. 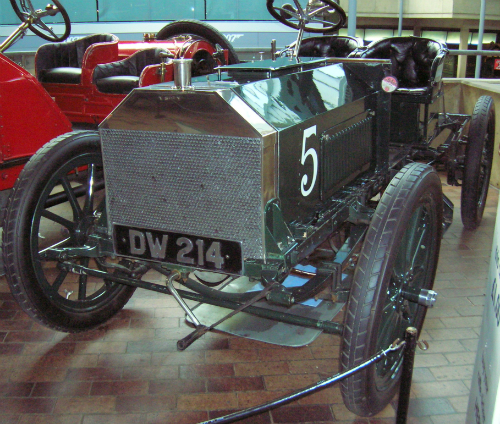 Not all of the veteran vehicles at Beaulieu predate 1900, and not all are cars. This 1900 Royal Enfield is actually a quadricycle, or a four-wheeled bicycle with an engine. Yes, that is the same company that made the Enfield rifle. It seems an odd combination but apparently they started business making bicycles and gun parts, then expanded into motorcycles. This particular vehicle was a prototype. 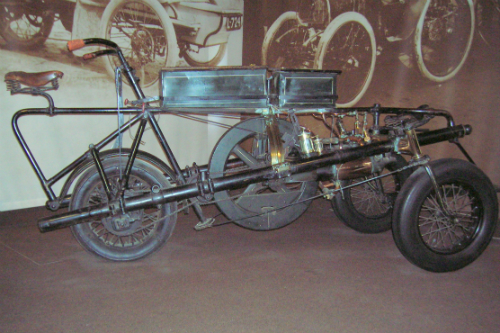 According to the vehicle list on the National Motor Museum Trust website, this quadricycle, with its one cylinder 244 cc engine, didn’t have enough power to get up hills without a push from its crew. Despite this, it’s been in the London to Brighton run. 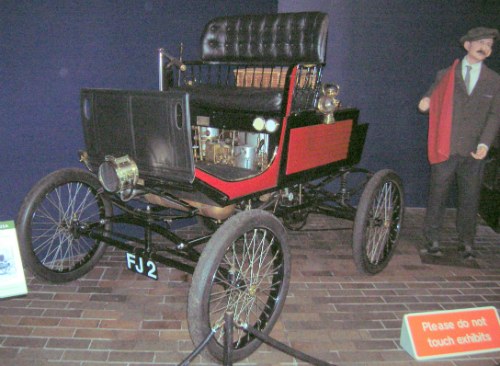 The 1901 Locomobile from the States ran on steam power, which wasn’t uncommon at the time. This one’s been rebuilt and given disc brakes in the rear so it can be driven in today’s traffic. It will do 30 mph, and according to its advertising, was “vibrationless and noiseless.” Not sure I’d be comfortable with the idea of sitting on top of a steam engine. 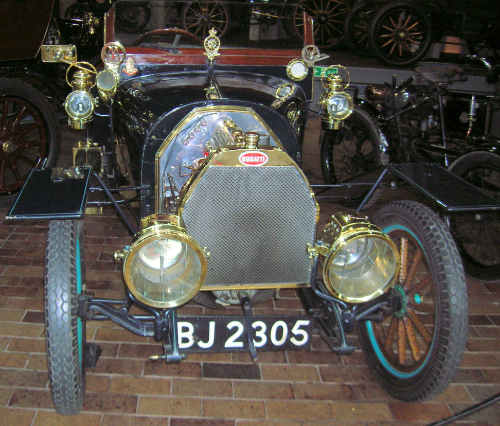 This 1903 De Dion Bouton was one of the vehicles belonging to the second Lord Montagu which formed the Museum’s original collection. It was used on the estate until the early 1930s and has made the London to Brighton run on several occasions. This 1903 Mercedes 60hp has been owned by the Harmsworth family since it was bought new. 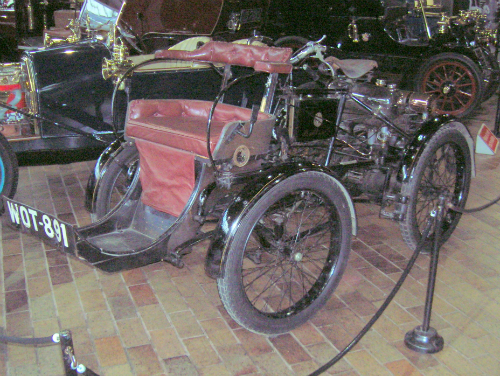 The first owner, Alfred Harmsworth, was the founder of the Daily Mail, and quite interested in motor sports. This car competed in various speed trials and hill climbs back in the day. It was quite a fast car for its time, with a top speed of 75 mph. 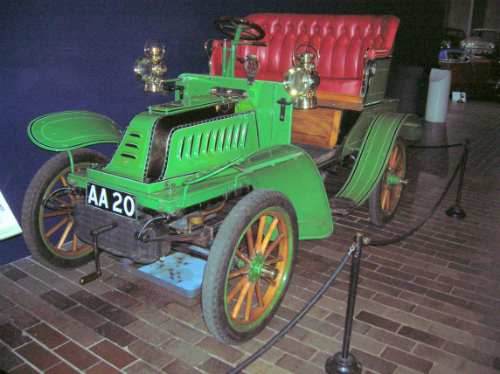 The original body, a two-seater, was replaced in 1907. More veteran cars to come. I’m nowhere near done with the National Motor Museum at Beaulieu (got to talk about the Bond exhibit, among other things), but thought you might appreciate a laugh on Friday. Here’s Red Green, Canada’s favourite handyman, explaining how to build your own mid-engined car for a lot less than the price of a Lamborghini or Ferrari. There are some very old cars indeed at the National Motor Museum. I guess that’s not surprising given that the collection got its start from the cars of the second Lord Montagu (it was actually founded by the current third Lord in memory of his father) who was an early adopter of the sport of motoring. 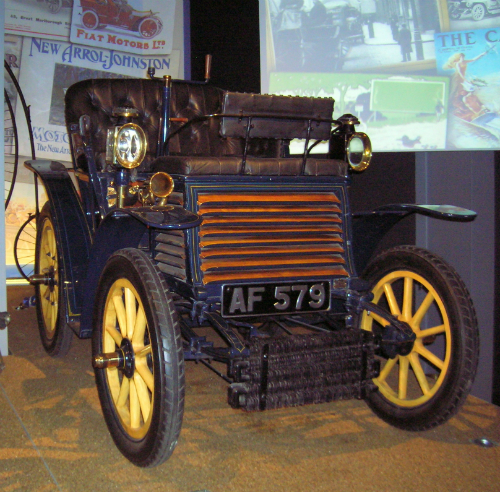 If you search under “veteran” on the National Motor Museum Trust’s webpage, you’ll actually come up with a list of 40 vehicles built between 1880 and 1914. That includes everything from the 1880 Grenville Steam Carriage, thought to be the oldest self-propelled vehicle capable of carrying passengers that still runs, to a Model T Ford. Of course, not all of those were on display when I was there, but I did see six vehicles predating 1900, not including the 1886 Benz, which is a replica. Sadly, the Grenville Steam Carriage was not among them, as I know my dad would have loved photos of it, but it’s still got more veterans than I’ve ever seen in one place before, or, for that matter, at all. The first one to catch my eye was the 1895 Knight I posted a photo of in my last blog entry. It runs on petrol, which wasn’t that common back then. At the time it was built, speed limits for motorized vehicles in Britain were 4 mph in the country and 2 mph in town (slower than horse-drawn vehicles) and you were required to have someone walking in front of them. Builder John Henry Knight was fined for breaking this rule, possibly the first motoring fine. 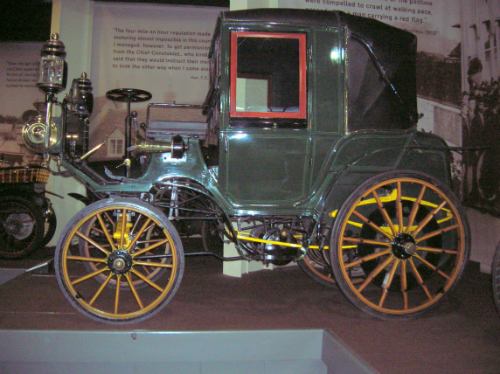 These rules, according to the London to Brighton Veteran Car Run website, were replaced in 1896 with the Locomotives on the Highway Act, which increased the speed limit to 14 mph and removed the requirement for the walker in front. Motorists celebrated by organizing an Emancipation Run on November 14, 1896, which was the first London to Brighton run. 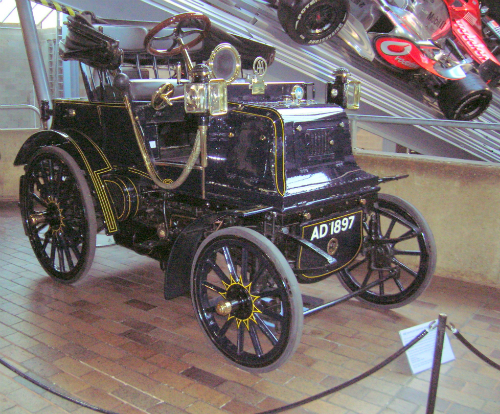 Next up was the 1896 Pennington Autocar, one of only five ever made. Its builder was Edward Joel Pennington, who said it would carry four people, do 40 mph and had unpuncturable tires. 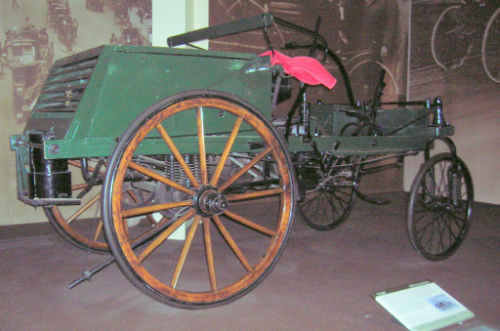 According to the plaque beside the one in the museum, one of the Autocars was entered in the Emancipation Run, but had to withdraw due to a burst tire. Then there’s the 1897 Daimler Grafton Phaeton (top of the page), currently owned by Jaguar Daimler Heritage Trust and driven regularly in the London to Brighton run. It’s not listed on the museum trust’s webpage (possibly because they don’t own it), but according to its plaque, it’s not only the oldest remaining Coventry built Daimler, but it’s only had four owners! Sure is a beauty. There’s another veteran Daimler as well, an 1898 Canstatt. This one was built in Germany, however. Like some modern German sports cars, the engine is tucked in the rear. And rounding out the 19th century half dozen are an 1899 Fiat and an 1899 Renault. Yes, both companies have been around that long. The Fiat has a passenger seat facing the driver’s seat, which doesn’t strike me as a particularly good arrangement for visibility, but maybe it’s less distracting than having your kids sit behind you. As for the Renault, it’s one of the few early cars with a reverse gear. A week and a half ago, I had the chance to tour the National Motor Museum in Beaulieu (pronounced, despite appearances, as Bewley) near London. I wasn’t sure what to expect, though their website looked promising, as the online reviews I’d seen had been both pro and con. Would it be worth the hassle and expense of a two-hour train ride, followed by a taxi trip, apparently the only way to get there without renting a car? Though given London traffic, it was probably actually cheaper and quicker to take the train. For me it was worth the trip, but it depends what sort of cars you are interested in. There’s almost no American muscle in the collection (though there is a Shelby Cobra). There’s not much in the way of exotics, either, except for what’s in the visiting Bond vehicles exhibition. But as far as a good, solid history of British (and European) motoring, especially up to the early 60s (though they do have more recent stuff), the museum is fantastic. If you love vintage cars, you’ll really enjoy it, as they have several from the 1800s, including some veterans of the London to Brighton run. There are some vintage motorcycles to be found in the collection as well, and a sweet collection of British race cars. As for the Bond exhibit, which contains 50 vehicles representing 50 years of Bond films, it’s running for the rest of the year and is well worth a look for any Bond fans. The World of Top Gear exhibit, which contains some of their “challenge” vehicles, is amusing enough, but not worth a trip out just to see it. 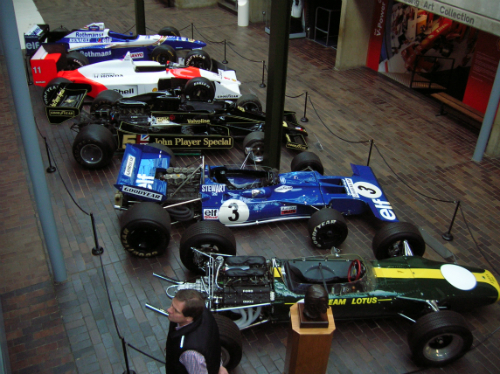 My biggest quibble with Beaulieu was that they have so much on display that it’s hard to get a good look at any of it. Most of the cars are parked cheek by jowl—it’s not a coincidence that most of my shots were taken head-on. Also, the main building is not heated very well (I think it’s open to the air at the point the monorail comes in, though that didn’t seem to be running the day I was there) and some of the temporary exhibits are actually outside in tents. So be prepared for weather! I’ll be covering parts of the collection in more depth, but wanted to give an idea of what it was like first. famous 24-hour endurance race in France in June. If I had to pick my favourite North American sports car, the Viper would be it, although I have to admit that’s based purely on its looks (yes, I am that shallow). It does have a lot of power under the hood, though, and SRT Motorsports hope to show that off in Europe. They’ve received an invitation to participate in this year’s 24 Hours of Le Mans endurance race, running June 22-23, and will be sending two factory-supported SRT Viper GTS-Rs along. 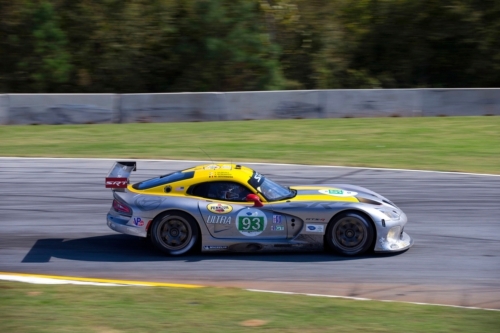 SRT Motorsports Vipers will also be participating in the 2013 American Le Mans Series. All very well for Viper fans, but I suspect most Mopar diehards would prefer to see Chrysler return to NASCAR. BMW M3 DTM Champion Edition model. Last year was the first year BMW Motorsport had competed in the Deutsche Tourenwagen Masters (DTM), a German racing series for touring cars, since they’d participated in its predecessor, the Deutsche Tourenwagen Meisterschaft, back in the 90s. You can check out this article on Wikipedia for more details on the series and its history. Or you might want to check out the official DTM website (they have an English version) for more details on the various cars and drivers. It seems BMW was quite pleased with its performance. It received the manufacturer’s honours, its team finished in top place, and Canadian driver Bruno Spengler claimed the drivers’ title. 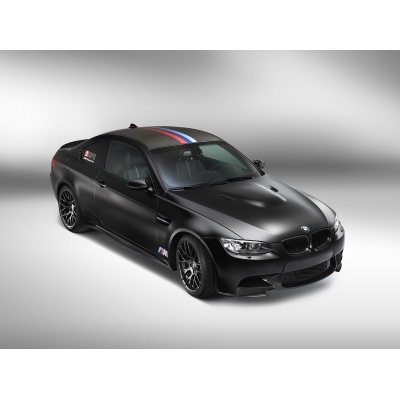 As a result, they’ll be releasing a limited edition BMW M3 DTM Champion Edition. It comes in Frozen Black metallic, with lots of carbon fibre trim, and is meant to look like Spengler’s winning car. 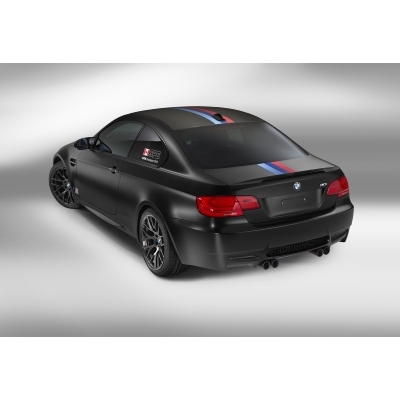 It’s set off outside with a BMW M stripe running over the hood and trunk, and BMW M logos and decals. Inside, there’s more carbon fibre trim sporting Spengler’s signature and the car’s serial number, door sills copying Spengler’s helmet design, and lots of leather trim. Lots of goodies under the hood, too, including the Competition package, and the M Driver’s Package. And to top it all off, each new owner has the chance to take the BMW M Fascination Nordschleife driver training course, run by Spengler himself. The cars (there will only be 54 of them) are currently being built in Germany and will start around €99,000.00.